I have been a little quiet on the blog as I took some time to enjoy five treasured days, the only ones that Ade had at home this month. I collected him from the airport at La Rochelle and we treated ourselves to a date at the delightfully decorated Café de la Paix before heading home where I kept him busy with the list of things that had broken/gone wrong in the time he had been away. I can’t tell you how lovely it was to have someone who was strong enough to put the front gate back on it’s hinges, someone to look at the slow puncture on my car, someone to struggle along with when manoeuvring the heavy pot plants indoors for winter, someone to encourage me to get out on the bike, someone to snuggle up with at night and someone to talk to when watching TV of an evening, even if we did miss many of the programmes when the talking took over. I even enjoyed getting up early on Sunday and making him a fresh batch of plum jam that was still warm when we breakfasted on our croissants and coffee. My lovely weekend has evolved into a very busy week, as I am part of the organising team cooking up a meal for over 100 people for the Téléthon charity this weekend. 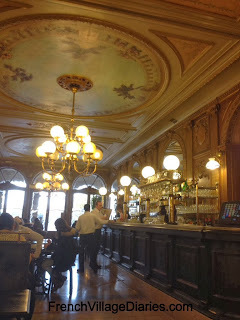 I have been shopping for vast quantities of food and drink, helped with peeling kilos of vegetables and tonight we will be setting out the tables and chairs in the salle des fêtes before eating a yummy tartiflette together. Top tip – if you want people to come and help with something always offer a delicious homemade meal. Thankfully having Mini and her doggy friend Toffee, who is staying with us this week, means I do have to go out every day and enjoy some quiet time in the countryside. 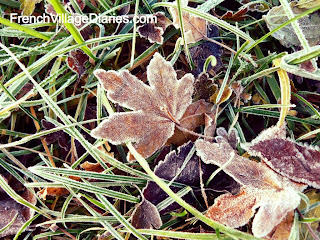 There is not much to beat a crisp, early morning December walk with frosted hedgerows and mist clinging to the fields. Winter isn’t my favourite time of year but I can appreciate the beauty that is out there when you take time to look. The cold and frost are suggesting winter, but the stubborn golden leaves are still clinging on to autumn. There are deer in distant fields that thankfully the dogs don't notice and clouds of lapwings crying and calling out in protest as we disturb them in the fields. Life may be busy, both for Ade away at work and for me but I’ve lots to be thankful for and it won’t be too long before I have another date with my favourite man at my favourite café in La Rochelle. I hope you enjoy these pictures from my dog walks.